We understand buying fresh seafood online can be perceived as an uncommon practice. At Anderson Seafoods, we are changing the way consumers buy fresh seafood online. This can be seen in our packaging and design. Our engineers worked tirelessly with UPS for over a year to take packages through a variety of shock and impact tests in extreme temperatures and humidity to configure the best shipping solutions. Every fresh and frozen seafood order is hand-selected at our state of the art facility, and packaged in an eco-friendly container designed to maintain its contents at optimum temperatures for your enjoyment. Please review the handling instructions below to begin enjoying your fresh and delicious seafood! We use an exterior box made from 40% post-consumer recycled material, which has passed a comprehensive testing process by UPS. An eco-friendly liner is placed inside the box to assist in maintaining temperature and prevent leakage. All fresh seafood is Cryovac-Sealed to minimize damage during the shipping process, but also to minimize moisture loss. Frozen seafood will be enclosed in plastic bags. Cold packs are included to maintain optimum internal temperature. The entire seafood packaging process takes place in a 38 degree environment to ensure that your fresh seafood arrives in pristine condition. Perishable products should be refrigerated or frozen. Slightly thawed sealed portions may be placed safely in freezer with no perceptible loss of quality or nutritional value. Unopened vacuum-packed smoked Salmon have a refrigerated shelf life of 2 weeks. After opening, smoked Salmon is best consumed within 3 days. Ideal temperature for storing caviar is between 28°F - 30°F. If refrigerated, an unopened jar of caviar will stay fresh for up to four weeks. Opened caviar should be consumed within 2 - 3 days. Fresh seafood packages have a refrigerated shelf life of 3 days. Consume frozen seafood within 1 day of thawing, or keep frozen. We recommend that all frozen seafood be defrosted by placing product in the refrigerator for 12 to 24 hours depending upon the density. Never force thaw a product by running it under water (hot or cold as it can cook the product). Not only does this reduce the flavor, but it is also a health hazard. 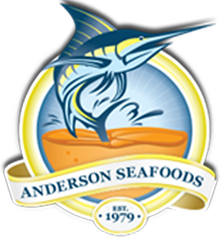 Thank you again for buying fresh seafood online from Anderson Seafoods!